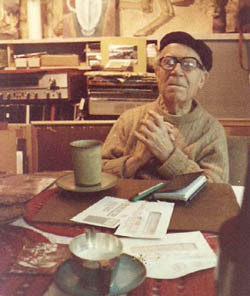 René Alexandre Paul Cera was born in Nice, France, on April 15, 1895, and died in Lenox, Massachusetts, on April 20, 1992. When he was 10 to 12 years old, he delivered messages and paint to Renoir, and later sketched with Matisse. He painted "Pied Pipers All" for Canadian media guru Marshall McLuhan (MacLean's Magazine, Dec 2, 2002, pages 66-67). His paintings can be found in several locations in the United States, including the Berkshire Museum, the Pittsfield High School library, and the Lenox National Bank, and in Canada, including the Hamilton Art Gallery, St Michael's College in Toronto, and in several Canadian and French embassies. Cera's parents were both artistic. His father was a furniture craftsman and his mother a dress designer. He studied art and architecture at the Nice School of Art, and ran messages from the school's director to Pierre August Renoir, who was crippled by rheumatism and was painting with the brush strapped to his fingers. At 19, Cera became an infantry soldier and was badly wounded in the First World War. On recuperation, he joined the cavalry and three years later was awarded the Croix de Guerre. He then settled in Paris and participated in several international exhibitions of modern design at the Salon des Automnes. He was then appointed director of the house of Martine, the architectural branch of Paul Poiret's business. In 1928, René Cera agreed to supervise architectural design for Eaton's, Canada's then largest department store chain, and remained in this position for the next 32 years. In 1960, René and his wife Elizabeth retired to Lenox, Massachusetts in order to be near the artist's colony in Tanglewood, and he spent most of his time painting. Among several large murals dating from this period was "Pied Pipers All", currently at McLuhan Centre for Culture and Technology at the University of Toronto. This work echoes McLuhan's sentiment "The media is the message". The theme of the painting is "T.V. in Action" with the tube in the centre and psychedelic images surrounding it. The title "Pied Pipers All" conveys Cera's message that the tube was alienating the young from a generation of elders who had no thought of paying the piper for the latest technological caper. Cera's early period evokes classical friezes, Picasso (Blue, Rose and Clown periods), Monet and his middle period, Matisse, Picasso and Leger. The later works, painted after Cera broke his hip and was unable to stand at an easel, suggest Braque and Klee. Cera's inspiration, no matter what the style, is his inner self. Cera's paintings, whether or not they contain recognizable objects, are filled with music and dance. In his own words, "All the colours you can use already exist. How you put them next to each other creates that disturbance, that vibrancy. It is no different from composing music or writing. It is choosing the right mix of music or words to convey the essence of your thoughts". His paintings were exhibited at the Cormier Art Gallery as " an exquisite jewel of a show. This small yet glittering exhibit of Cera's paintings and drawings represents a brilliant and prolific career that spans two continents and more than three-quarters of a century". Many paintings and drawing from this exhibit were also shown at the Berkshire Artisans Gallery of the Pittsfield, Mass Arts Centre.